(in) one shining moment, it's all on the line. In college basketball, it's all about the One Shining Moment. The buzzer beater, the upset, the super human performance...that second when your team catapults forward into true March Madness on one of the world's largest sport stages. For Georgia, the last time we really experienced that sort of post-season euphoria was during the 1996 NCAA Tournament following a victory over #1 seeded Purdue in the second round. Since then, we've been the victim of a series of One Shining Moments for the other guy (See: John Wallace's Miracle Three in '96, the UTC big man that seemingly never missed in '97, and the entire SIU team performance in '02). We were also the victim of One Turd Filled Moment in March 2003 (See: Jim Harrick,Tony Cole and Mike Adams). But how far away are we from getting there again? How long until we see our shooting stars on the biggest stage? How long until we feel the pride of watching our guys compete for glory in a tournament that really matters? I have no idea. But right now, things look dim from my seats. With yesterday's loss to UK, the Dawgs are 2-4 in SEC play. On Wednesday night, we will likely be underdogs at home against a Vanderbilt team with arguably more talent and unarguably more to play for. After the Vandy game, we get 5 of 8 games on the road...and our woes away from Stegeman are well document. Our lone home games during that stretch will be against Florida, Tennessee and South Carolina. It's now hard to see this team finishing SEC play with more than 5 wins. Is that good enough? Obviously not for the Big Dance, and probably not for the Sock Hop either. So, how long must we wait? Well, that all depends on how much patience we're really willing to show vs. how much patience should really be required. In 1979, Georgia had never been to the NCAA Tourney...heck, we had never been to the NIT! Four years and 1 Hugh Durham hire later, we were in the Final Four having beaten Michael Jordan's UNC team in the Elite 8. In 1990, the Florida Gators were an SEC bottom feeder. Their program had arguably less tradition in basketball than Georgia, Auburn or Ole Miss, and they had just completed a season in which they went 7-21 overall and 3-15 in the SEC. Four years and 1 Lon Kruger hire later, they were in the Final Four. In 1999, Georgia was laughed out of the NIT at Clemson. Ron Jirsa had driven the program into the ground, and his incoming recruiting class was almost a complete disaster. After hiring Jim Harrick and suffering through an initial 10 win season, Georgia squeaked into the NCAAs in Year 2, and landed a #3 seed in Year 3. In 2003-2004, Baylor University's basketball program found itself dealing with a scandal involving player to player murder, drugs and recruiting sanctions. The scandal was so severe that the NCAA gave Baylor what amounts to the "Half Death Penalty." Along with scholarship reductions, the team lost the ability to play non-conference games for an entire year. In the scandal's aftermath, several of the team's top players transferred. Five years after the scandal started, and two years after the half season penalty, the Scott Drew and the Bears are now 16-4 overall and 4-2 in the Big 12. They will get their One Shining Moment this year. It doesn't take six years to build a program. No matter the circumstances. I'm as familiar as anyone about what it took to get us into the mess we're in now. I know all about Harrick's recruiting (or complete lack thereof), the NCAA scholarship reductions (which were later overturned) and our university's perception within the AAU community. But you will struggle to convince me that we were worse off than Baylor was at roughly the same time. So when is our next March Madness appearance? Like I said...I don't know. But there's an old saying, that I remember in times like these. "The best part about hitting yourself in the head with a hammer...is when you stop." I'm not giving up, and I'm not calling for anyone's head. I'm just suggesting that Felton is going to make his life incredibly miserable if he doesn't get this team together in a big damn hurry. Felton really needs to start showing progress soon. Yesterday, we had the perfect storm for a huge pro-UGA crowd. A weekend game, a big name opponent and an advance sellout. Instead, we saw thousands of UGA no-shows in the alumni and student sections, and what looked like 1,500+ UK fans. We can't let apathy continue to fester among the broader UGA population. I'll still attend just as many as I always have. But it's hard to sit here with a straight face and suggest that this is even an NIT team. And if it isn't...when will things turn around? I was at the game. Being that my father attended UK, as did I for a some time, and I grew up a Cats fan its hard being a UGA student and fan when UGA/UK play. What I noticed was a lack of ball movement from UGA. I have watched a few games on TV, I have not been to many this year, but I have been going to games for the past few years. This lack of ball movement, and off ball movement, seems to be something that is a pretty consistent staple of Felton basketball. There are times when they do these things well, but for the most part these fundamental attributes are missing from the team/game plan. UGA also seems to live and die by the three. Basically UGA's offense seems to be more of a one on one game where players like Gaines are forced to beat their man and drive to the basket to score rather than a team oriented offense where the ball is moved around, players are moving off ball and trying to get into good position. This shows up a lot in the amount of assists UGA has. Not sure what the total was, but I remember looking at the board at one point and UK had probably more than double the amount. When UGA plays it seems more like rec league basketball. They try to beat their man one on one, jack up a three, and or push for a fast break. That sums it up IMO. Agree with all that's been said. Plus, it's important to note that Georgia was at a serious disadvantage in 2005 and 2006, when the conference was arguably the strongest it has ever been in men's basketball. Not so this year -- aside from Tennessee, Vandy, and Miss St., there are no real powers in conference, and the program should have been peaking at just the right time to get a boost in public perception. Instead, we're underperforming (and not just in conference -- we had what I'd call the easiest OOC schedule in three years this year, and failed to capitalize). 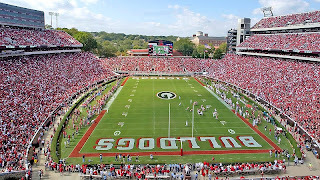 Other SEC programs (Florida, Miss, Ark, Vandy) are rebuilding with better talent than Georgia can field right now. It's not getting any better anytime soon, at least at the current trajectory. Fire Felton, please fire felton!!! A few thoughts on Saturdays and the program in general. On the positive side Dave Bliss has really impressed me this year. I can't believe I just typed that. He's a good hustle guy on a team that is sorely lacking in hustle. Other than that it was the same old from the Dawgs. Kentucky isn't that good and they were without their starting point guard. We still couldn't get it done. We need a lot to take that next step. We need a pass first point guard. We need a reliable outside shooter. We need a slasher that can get to the basket. We need a post player with an offensive game. We need a long post player that can bring something defensively against the Patterson's of the basketball world. But most of all we need an attitude change. We need an exciting basketball team to watch. 5 years of the stand around and jack up a 3 offense is just too much. 5 years of knowing we have no chance on the road is too much. I completely agree with you Paul as far as the time thing goes. Hell, we had the talent to go dancing last year. And in Felton's first year. Guess what? Didn't happen. I guess what I'm aiming at is the time has come for a change. Not only in the HC position but in our athletic departments philosophy in the promotion of the sport. We have to give a damn about promoting the sport to be successful in the long term. If we don't then why have a team in the first place? As far as the no-shows... I'm not surprised. If I still lived in Athens I would've been there. But I can't blame others for not going. i am beginning to think that you are more of a b-ball fan than a football fan. I think Paul is a Georgia fan. Georgia sports don't stop after New Years. Agreed on the statement about how long it takes to build a winner. 5 years with little progress is too long. not that i care really but I couldn't help but noticed that the Lady Dawgs lost to ANOTHER UNRANKED team today AT HOME to vandy. Andy Landers is so lackluster in his coaching. You could pick no one else to do less with the talent at UGA. Well said dawg 05. watson, I was thinking the same thing myself. First about Baylor, you could not be more right about that. I forgotten about the virtual death penalty handed down to them by the NCAA a few years back and now I'm watching them on ESPN and hearing analysts talking about them unprovoked, mentioning them in casual conversations on air. Secondly, if I had a dollar every time I turned to friends yesterday and asked why the hell is Jeremy Price not in the game I would have made a pretty penny. It was and is sickening to watch Albert Jackson waste his time in the paint. It's like the ball is kryptonite because every time he either gets the ball or the ball is close to him he forgets how to jump over 6 inches. Like I said yesterday, I just don't see how UGA can get anywhere with the direction that Felton has set for us. Amen to Mitch and Watson. I was really kind of hoping with Dooley gone that the AD would actually pay attention to the sport of basketball at UGA. Before you say it, PWD, I know we've got a new practice facility coming (maybe already done), but our gym still looks like the inside of a golf ball (to quote Dennis Miller). It seems clear to me that Felton has failed to connect with the team the way, say, Richt has connected with the football team. Stated another way, he does not seem to be bringing much energy to his role as the coach. Compare his effect to that of Bruce Pearl on the Tennesse program if you don't like the Richt comparison. With Felton, we just seem to have the "same old same old" in UGA basketball. Felton's era is not markedly different from most of UGA's basketball history - fair to middling. Having said all that, I thought the team played hard and could have beaten Kentucky if they could have hit a shot in the last few minutes. As for the offense, or lack thereof, Felton's offense reminds me of the old Hugh Durham "innovative no motion offense" - just stand there long enough and your defender will forget about you and go get a coke and then you'll have an open look. Of course, the end result is a bunch of forced shots. 9 of ESPN's 150 recruits are from the state of Georgia. Next year...we are getting one. tech isnt any good right now, atlanta dumps out so much talent, that there is not reason we should not have a solid program filled with big talent...maybe it would help if we could keep our big talent actually on the team! As for the Anon who said I'm more of a b-ball fan than football fan, and "that's saddening." A. I have no idea why that would make you or anyone else sad. B. Your theory would be wrong. C. If you're uncomfortable with the time spent by me on each sport, my recommendation would be to check out www.blogger.com. From there you can create your own blog, and show the world how it should be done. In the words of the immortal Lewis McDonald Grizzard, Jr (a great American), "Tell it all brother". Living up here in Kentucky, I'm getting tired of the disrespect Georgia is getting. The loss Saturday didn't help. Dennis Felton is probably a very nice dude, but the bottom line is that he's not getting it done. Time to give someone else a chance. Could someone expand on Georgia's perception in the AAU community? I'm familiar with AAU ball but don't know much about the recruiting end. Any opinions would be appreciated. I love your blog and I read it daily, but I don't like it when people question my fanhood for not attending UGA basketball games. If there's an interesting match up at Stegeman AND there's a chance we'll win, I'll definitely be there. Unfortunatly there haven't been too many games that met that criteria in my four years at UGA. When the Dawgs start improving/Felton is fired/strippers headline the halftime show let me know and I'll be there. I'm not questioning your fanhood. Lots of folks didn't want to go. I'm questioning how many more fans we can alienate into not wanting to come to the game. Fans aren't the problem. You have to give people a reason to come to a game. HOPE is a great reason. Now, Georgia can be expected to make the tournament, win a couple of games, and then bow out. In fact, my bet is that they lose in the 2nd rounds of the SEC and NCAA tournaments. As for Dennis Felton, he was a smart hire, except in hindsight. He seemed to be a young coach on the rise. Unfortunately, our "One Shining Moment" is more of a "Flash in the Pan."